I got my day's digging yesterday. It wasn't entirely dry: in fact, by the end of the day, there had been two heavy downpours, although these were interspersed with patches of sun that were almost too hot. Situated as we were at the very top of the hill, looking down over the sea to east and west, you could see the dark grey clouds as they sailed towards us, then away again. The heaviest shower was, fortunately, just as we were having our lunch, and we were able to squeeze into the Portacabins; the second-heaviest, though, was in the afternoon after lots of insignificant sprinkles, and those of us who chose to keep on working through it found that we were kneeling in muddy puddles, and had our movements impeded by stiffened limbs and heavy clothes. Soon after arriving, I was collecting my bucket, kneeling pad, trowel and shovel, and shown which compound I'd be working in. I'd rather expected lengthy training, but it turned out that all I had to do was to kind of scrape over the ground with the trowel until I reached the chalk bed, a couple of inches below. 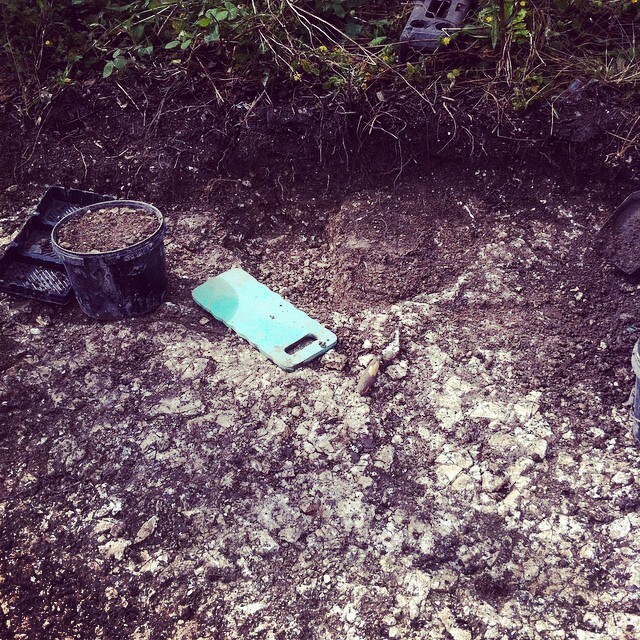 Anything that wasn't chalk or soil was potentially of interest, and we had to put it in a 'finds' tray; everything else went in the bucket and then was tipped out onto the ever-growing hill of spoil at the back of the plot. I was probably over-zealous with what I kept, but I'd rather have been safe than accidentally discard something significant. Especially as, later on, I heard about someone on some previous dig finding a gold ring on the discard pile. The woman next to me, a very pleasant lady who seemed to know a lot of people and be involved with many community projects, found a flint that looked to have been worked, literally within a minute of kneeling down to start digging - but that was about as good as it got. I had the feeling that the dig wasn't as bountiful, in terms of finds, than those that some of the experienced diggers were used to. 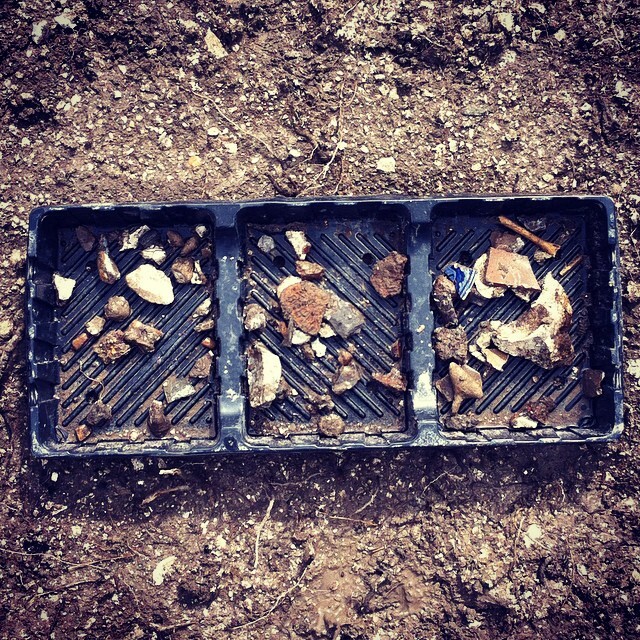 We found small pieces of probably Victorian pottery, but not much even of that. There were oyster shells, probably again Victorian, from when you would have come up to the racecourse for a race and some seafood. A couple of small bones, some flints that went in the tray even though they didn't particularly look shaped, just because they were flints and there weren't many about. My neighbour told me that she had an allotment in the area, and she often found people with metal detectors, who had heard rumours that there was once a 'palace' up here. She takes great delight in telling them that the monument is Neolithic, and predates any kind of metal. Earlier in the morning, it was just me, that lady, and another woman from the Brighton and Hove Archaeological Society who had enough experience to tell us what to do. Later, other volunteers joined us in the compound and we worked in a straight line. 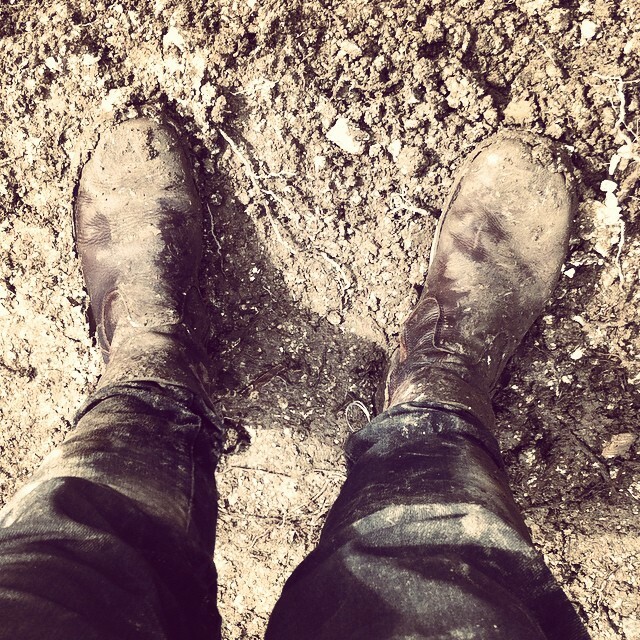 It's amazing how slowly we went, going through every trowelful of dirt. I must admit there was a real temptation to say, "well, there's nothing at all here; let's dig over in THIS part of the compound, or HERE" - but that doesn't appear to be the archaeological way. You do things methodically. Which does make sense, it just took a bit of self-discipline. A journalist from Radio Sussex came and asked us a few questions, and we went on digging, and chatting, and putting coats on and taking them off as the weather changed. We put all our equipment under buckets to protect it from the rain (just as well we did), had lunch, and came back. We wondered whether the blackening of some parts of the chalk bed was due to ancient fire, or modern fire pits. Ironically, what excited the real archaeologists in the end wasn't a find (spoiler alert: there weren't any. Or at least - there weren't any that we could immediately identify - everything was bagged up and will be washed and examined, whereupon they'll probably throw away 99.999% of mine, cursing me for thinking that a squashed ant and a 21st-century rusty nail might be significant). To the untrained eye, that is a bit of mud that is slightly lower down than the surrounding mud. But to a Proper Archaeologist, it's a sign that the earth has been dug down more in this spot than elsewhere. It could have been a ditch or a hole for a post. This is the most excitement we had all day. Once that was dug out (and they kept the soil that came from it) we all gave up meticulously fine-toothcombing our own areas, and worked in a line from the feature, quickly shovelling the earth with nary a care for what it contained, just to see if there was any continuation of the dip. We probably threw away a Neolitihic scooter and a hill fort user's manual. By this time, after the second heavy rain, the soil had become clay anyway. Anything within it was covered in mud and impossible to make out. Annoyingly, you'd wipe it with your gloved finger, and create what looked like tiny carved lines on pottery, but turned out to be imprints from your glove's fabric. There was no continuation of the dip. Not by 4pm, anyway. We went and rinsed our buckets and kneelers in puddles so that they could be put away, barely able to bend that far down, so stiff were we. As were were doing so, a local woman and her son walked up to ask what was going on. "Neolithic hill fort", we began. "Ooh," she said, "my friend has been saying for ages that they're going to get a metal detector and come up here". (ignore the small bogeys and red eyes) but I like it so I'm including it. 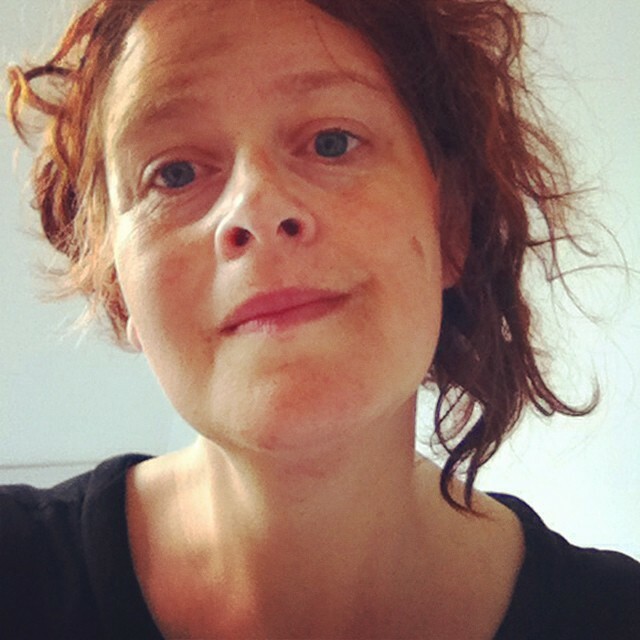 I went home and had a hot cup of tea and an ever hotter bath, the latter of which had an encrusted ring of mud around it by the time I came out. What did I learn? Primarily that archaeologists scrape away at tiny areas of the world, looking for such subtle variations that it almost seems needle-in-haystackesque. And that they have a really meticulous methodology that is quite easy to adhere to and makes really good sense. And that it's still exciting to scrabble around in the soil, even when you haven't found anything, so long as you're imagining finding an artefact and having it named after you when the paper is written about it. Having said that, the whole process is very collaborative. If anything that we did find was significant, we wouldn't have a way of knowing who was the actual person who found it, as the finds trays were shared and everything got bagged up together at the end. That's kind of nice, and a counterpoint to the strange phenomenon that, once you've been allocated your square metre to dig, you get very possessive of it. You really want to find something, and you really don't want anyone else to encroach on your plot. Also - I found out about the Brighton and Hove Archaeological society and their regular digs. Everyone was very friendly and I was asked more than once if I'd like to join. I *did* enjoy myself, but I'm really aware that I'm already over-committed. If those remains can just stay unfound for a few more years, perhaps I'll join up when I retire.